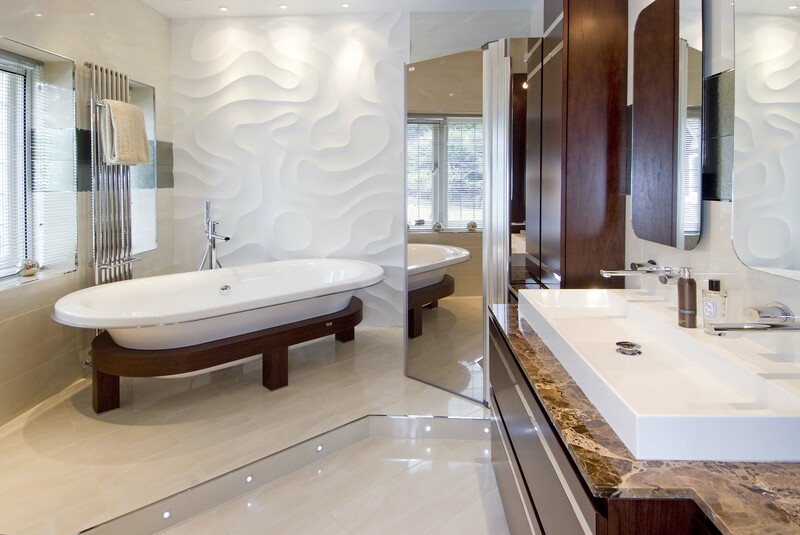 A bathroom is a room, equipped with a bath and or shower, basin and or toilet. Its purpose is for personal hygiene activities. It has come to signify so much more than just washing the body and undertaking bodily functions. 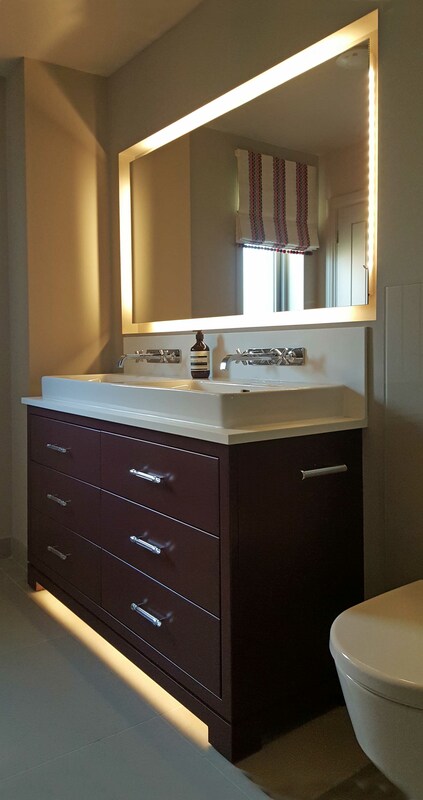 For practical purposes all the sanitary ware are required along with a good storage, good lighting, adequate heat and good ventilation. 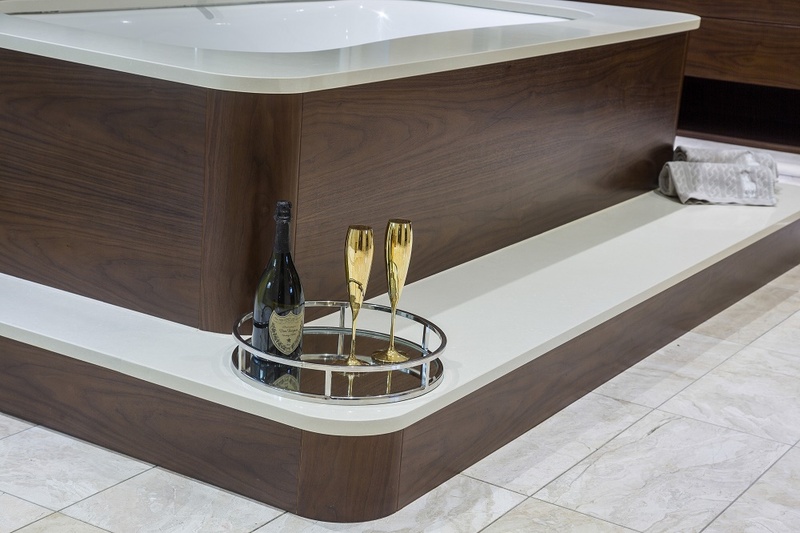 When working on the furniture for a bathroom we look at the storage solutions. 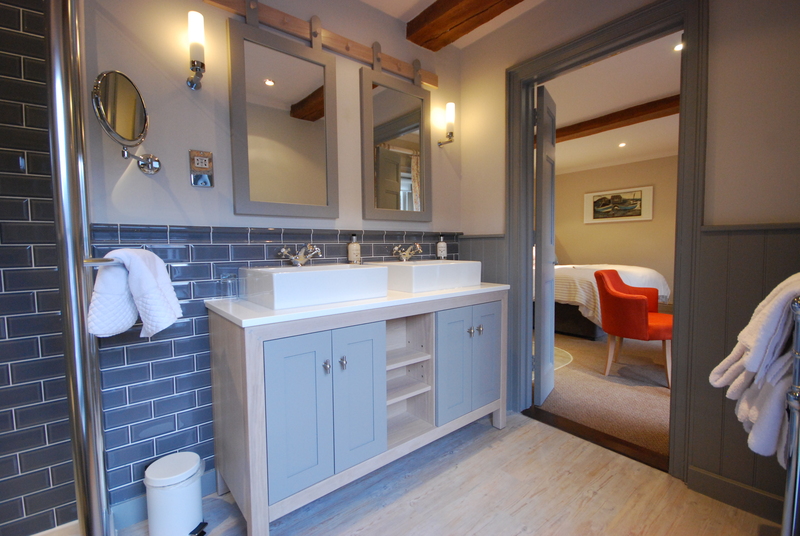 For a bathroom to be a relaxing and practical space the equipment used for washing the body need to be accessible but discreetly hidden away. Consequently bottles of shampoo, conditioner and shower gel need to be within reach but out of sight. Overcoming this problem with a few creative design solutions is probably our greatest skill. 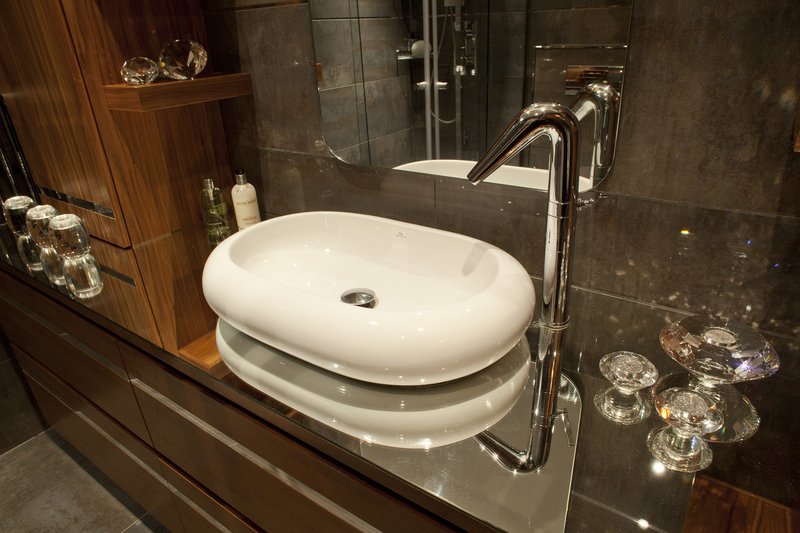 Items used at the basin can be put in easy to reach places like a vanity unit. Hidden shelves behind mirror glass doors of built in cupboards are our favourite. 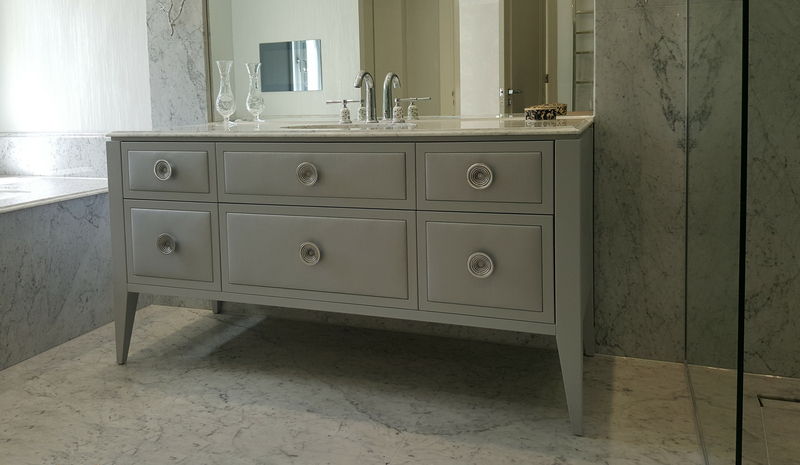 Vanity units with doors and drawers make the most of the available space. 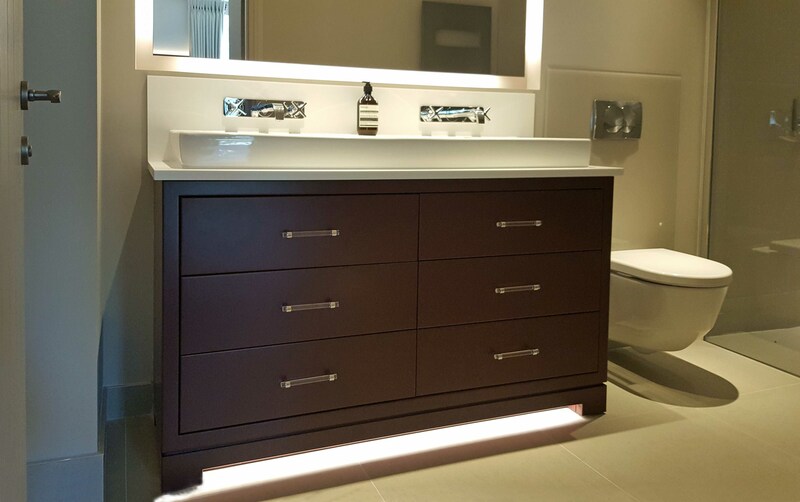 We have now incorporated lighting into the cabinetry to reflect off the floor tiles or walls to give more light. 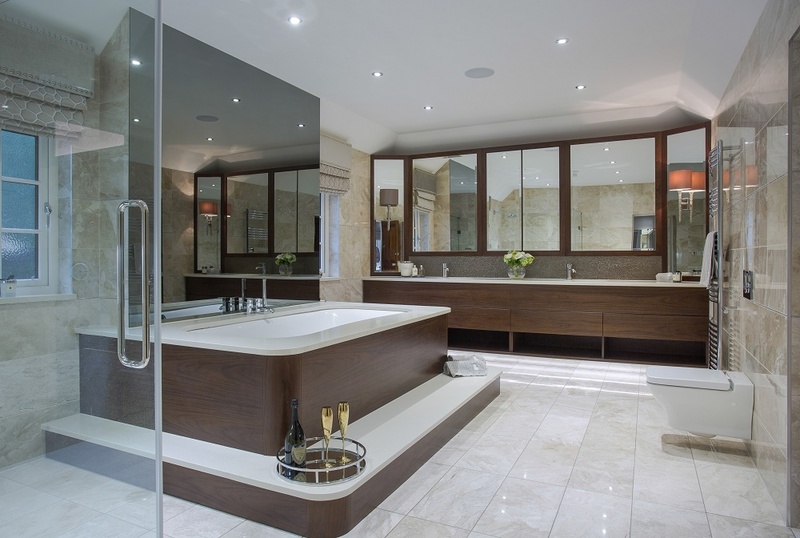 Formally hotels led the way in the luxury bathroom experience and this is now desired in the home. Innovation in technology has given greater scope and creativity for atmospheric lighting, and sound systems. 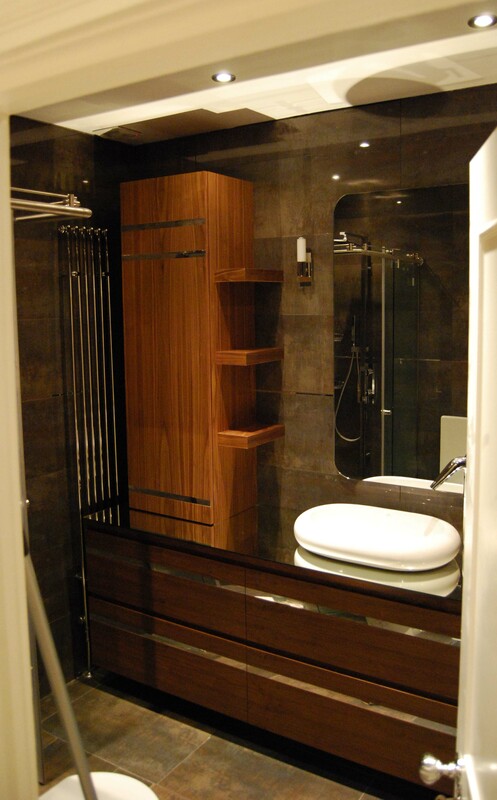 Heated mirrors that are condensation free and heated towel rails are now a necessity. 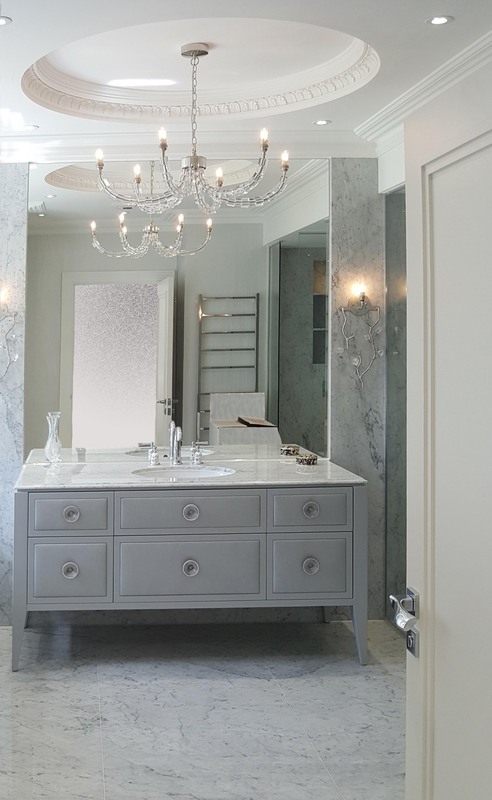 And no longer considered a luxury to keep the bathroom space warm and reduce a foggy mist. 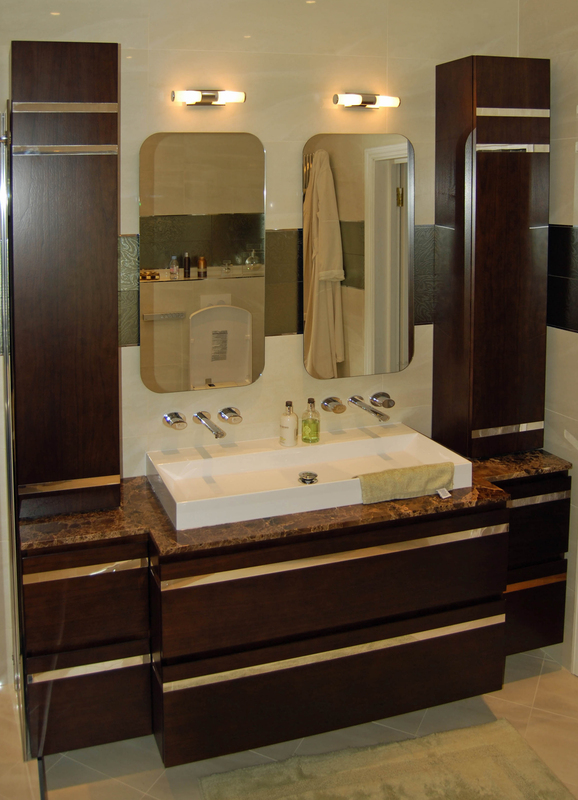 Once the bathroom sanitary ware has been decided upon the other considerations are storage. 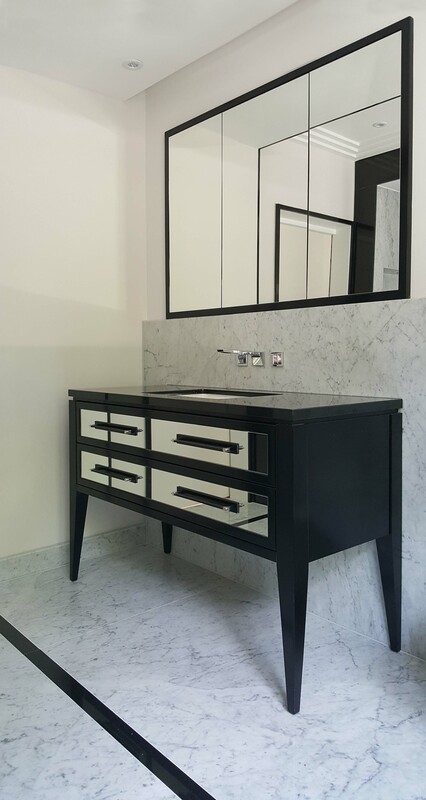 We offer a bespoke service for all vanity unit and storage needs, no matter how large or small the room is. 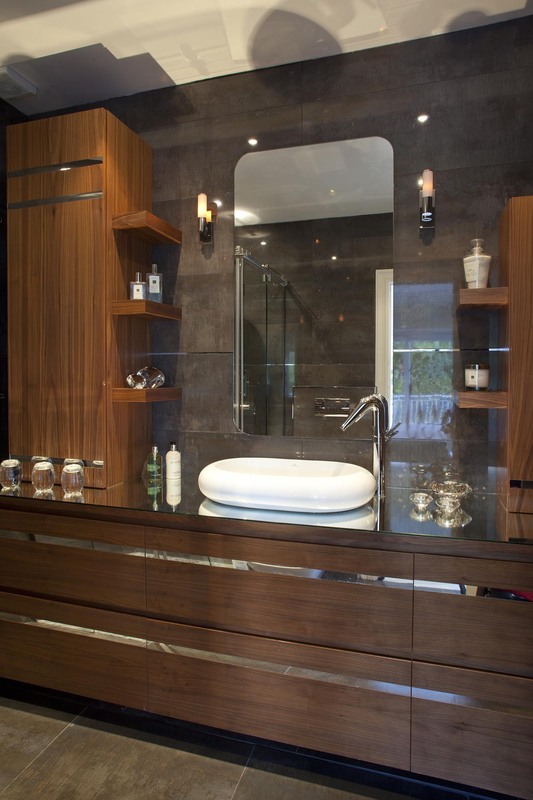 Wood in a bathroom is a viable option now with the use of specialist lacquers that prevent the damp getting into the timber. 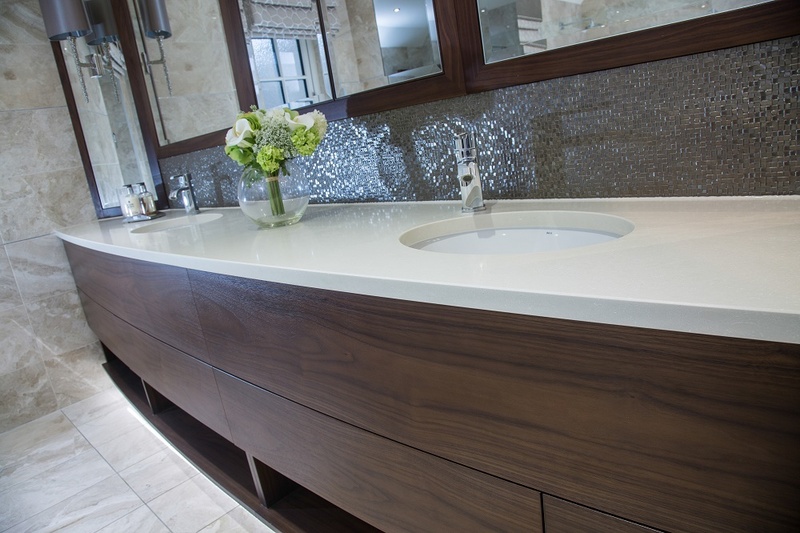 We can also work with man-made materials that look like natural ones. Marble or man made composites, make good tops as they are easy to wipe down and keep clean. Historically, bathing was often a collective activity, which took place in public baths. In some countries the shared social aspect of cleansing the body is still important, as for example with sento in Japan and saunas in Finland or the Roman baths of yester-year. 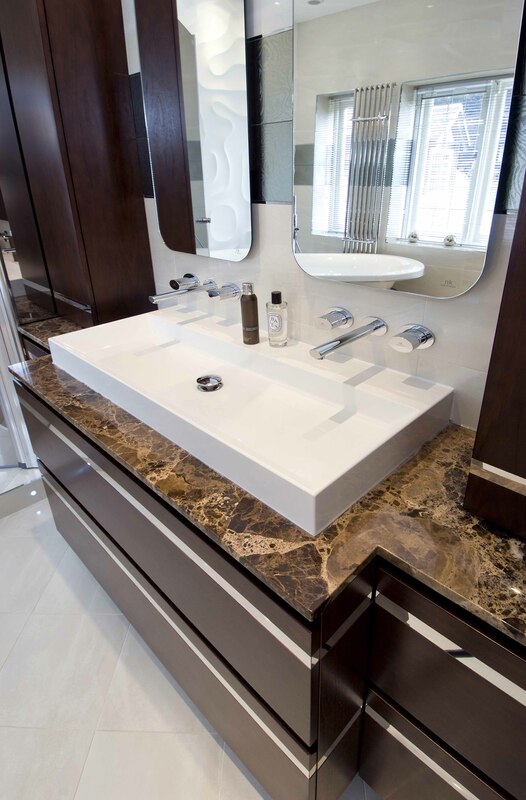 Today I think adults will go as far as ‘his and her’ sinks in vanity units but we like to keep our hygiene activities to a solitary pursuit.